Designed by James Braid, the Queen’s course opened for play in 1917. From the medal tees, the course measures less than 6,000 yards, but with a lowly par of 68, it represents an immensely enjoyable challenge. This is one of the finest parcels of golfing land in the British Isles. The holes weave their way across undulating moorland, through charming woodland, to greens set in pretty glades. The ball sits proudly on the springy fairways, inviting the most solid strike. The greens are true and ideal for bold putting and this really is an enchanting and exhilarating place to play golf. Gleneagles completed a renovation programme on the Queen’s course in 2017. Eighty-nine bunkers were rebuilt to improve drainage and enhance the sand line visibility on each of these hazards. Fairway mowing lines were also modified to return the course to James Braid’s original design plan. Additionally, the 16th green, which is laid out in a natural bowl shape, was also upgraded to improve drainage. Scott Fenwick, Golf Courses and Estate Manager, said: “As with the re-launch of The King’s Course last summer, our work over the last 18 months on The Queen’s Course has taken it back to how it would have been in Braid’s day. Braid’s bunker designs at Gleneagles were based on the courses supporting summer play only, so to bring them back to his original design concept, and make them playable all-year-round, marks a tremendous achievement. “In the mid-1980s we began changing the identity of The Queen’s to meet golfers’ expectations at that time, which included reshaping the course until the fairways became really narrow and the original bunkers were moved into the rough. Using archived photographs and Braid’s designs as our guide, we’ve reversed most of those changes, increasing the fairways by around 40 per cent. In my view it is too highly ranked, with 20 courses lower ranked but better. Definitely not as good as the Kings, although a composite course would be the stuff of dreams, with the Queens offering the 6th, the world class 10th, 12th and possibly the 18th (against the wind when I played). I played the Queen's course on a mild but sunny August day after weeks of rain in Scotland. The course would probably be considered short by most at a hair under 6000 yards, however soft fairways and a prevailing westerly wind make the course feel much longer, especially with seven par 4s over 400 yards and a par of only 68! My favourite hole is the 421 yard, par 4, 10th ‘Pint stoup’. The tee shot is very open, usually downwind and extremely inviting with the Ochil Hills in the background. The second shot is the fun bit of the hole for me as it demands an accurate shot to a green positioned in a bowl between two copses of pine trees. I hooked my drive a bit left into the light rough, but then felt great satisfaction from lifting a floaty seven iron shot over tall pines on the left to within 15 feet. Many of the other long par 4s including the 6th, 9th, 12th and 18th are great holes, although may play tough for the average golfer who may find they love them if they score well, but hate them if they become a bit of a slog. I actually particularly enjoyed some of the shorter par 4s which come towards the second half of the round and offer some well earnt relief from the trickier holes. The 8th, for example, is fun little hole that seems to naturally guide the drive for a nice approach spot. The 252 yard 15th is a great risk and reward, driveable par 4. The 378 par 4 16 also great fun to drive on as the natural contours from the bunkers can easily kick a good drive forward towards a small wedge shot. Overall, a great course that is by no means easy, but which offers some good birdie opportunities. It’s possible, and most likely probable, that the Queen’s at Gleneagles is the best golf course under 6,000 yards. Not just in Scotland but anywhere. Yet don’t be fooled into thinking this is a short layout which can be overpowered or that it’s a fiddly little thing lacking any real substance. The par of 68 (SSS 69) ensures that the 5,926-yard James Braid masterpiece, played up and over large natural ridges, through wooded valleys and occasionally across tranquil lochans, is more than a true test of golf. Indeed the first six holes all head roughly in the same direction and play into the prevailing wind. There is nothing short or easy about any of them with three of the four two-shotters topping the 400-yard mark. The best hole of this opening sequence is undoubtedly the sixth, a gloriously beautiful hole of 437-yards, which plays through a valley before rising up to a green sitting proud on an angled ridge plateau. If you’ve come through the opening third of the course unscathed (I didn’t) then you do have some opportunities to put a score together over the next few holes as well as on the much shorter inward half but there are certainly no gimmies and still a couple of card-wreckers to follow. The weakest holes on the course in my opinion are the first, 11th, 13th and 18th but they are by no means poor holes. The other 14 are either very good, excellent or in the case of the sixth, 12th, 15th and 17th truly superb. Played Queens early June. Fairways springy greens firm but not overly fast. A typical misty wet morning didn't dampen our spirits with view of some stunning natural holes cut into the glen. A nice array of longish par 4's going out mixed in with a plateau green par 3 second and a reachable par 5 seventh (which I did followed on by the obligatory three put) alas! The back nine is arguably better highlights include back to back par 3's around a lake. Followed on by Real risk reward 280 yard par 4, push your tee shot and you will rack up a big number! Overall a spectacular par 68 not a push over by any means but willing to reward good play (shot an 80 off a 14 h'cap) . Must lastly mention the whole experience , I've been lucky enough to stay at Gleneagles half a dozen times and no other resort comes close. I played this venue in consecutive days with the King's and also watched some holes at the PGA Centenary during this year´s JW Championship, so comparison can be done with no risk to be unfair. I believe the Queen's Course is less challenging than the King´s but a lot more true, with less blind shots and with nicer views although the three courses have very similar landscapes. The course itself is very fun to be played, with a lot of risk-reward holes but one thing I really don´t like is the lack of par 5s, the only one is number 7. But in the back nine you have three excellent par 3s (actually for most golfers 14th can be a par 3.5) and a very nice reachable par 4 (15th), where you can birdie or double bogey easilly, if tee shot is pushed the magic word "reload" will be heard. and after 10 days in Scotland, hole number 12th may be one of the best of the week, where if you are conservative you will face a long tough second shot, but if you take risk the approach can be a wedge. The course was in excellent shape despite some rain and the greens rolled very true and fast. If you travel to Scotland, you have to go and play as many links courses as you can, but a visit to Gleneagles (an amazing hotel and great staff) will for sure pay the bill, don´t miss it! I don’t know if any of you are familiar with the 1986 'Only Fools and Horse's" Xmas special 'A Royal Flush'? Hapless Rodney Trotter leaps up the social ladder when he manages to pull the Duke of Maylebury's daughter, Vicky. He is subsequently invited down to the ancestral pile for a weekend of shooting and he quickly discovers that he is way out of his depth. I know how Rodney felt cause I have previous. A bit of advice, never drive into Skibo Castle in a wee red Corsa if you are trying to pass yourself off as international playboys!!! The reason that I mention all of this piffle is because I was half expecting to be discovered as way out of my social depth when I turned up at Gleneagles. I wouldn’t have been too surprised to be thrown out on my Primark laden backside. 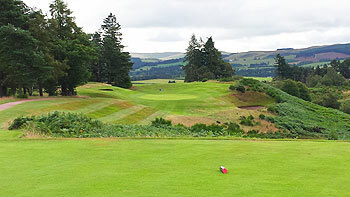 I needn’t have worried, we were treated absolutely brilliantly but that is the Gleneagles way, you are a King for a day. On the day we played, Scotland was covered in frost. The hour and a quarter drive from the west saw a minimal rise in temperature with the mercury only hitting positive when we entered Perth and Kinross, would frost stop play? Fast forward 2 and a half hours (Only 1 hour and 10 minutes after our allotted tee time and you would never have guessed that there had been any dodgy weather, the fairways were lush, the greens only slightly marked by a light spiking, we were more than good to go. I was pre-warned of the natural beauty of the Queen's Course but I suggest it was undersold to me, as the place is just simply stunning. You could be standing in a 3D Gainsburgh or Constable masterpiece it is just breath-taking. Our much-awaited visit to the Queen’s didn’t get off to the best of starts with overnight frost suspending play until nearly lunch time last Monday, so we had to hang around the temporary accommodation that’s in use during the current refurbishment of the Dormy House. Once we got out on the course at noon, however, the glorious, largely sunny conditions we had over the next four hours really showed this little beauty in the very best of light. Golf on this course is not meant to be too taxing as fairways are generally wide and open, but bunkers are large, deep and plentiful - the craters on the 7th in particular - so good scoring has to be earned. The opening half dozen holes are bounded on the right by discreet housing then the minor road that leads to Braco but that’s as close as the outside world gets to even a hint of outside interference. Of course, the telephone on the 10th tee just has to be dialled to place a late lunch order that’s ready 15 minutes later in the Halfway House beside the 11th tee of both the King’s and Queen’s courses. And as we sipped our cups of tea and looked out on the Perthshire hills from the cosy wee cabin with the sun streaming in through the windows, it merely confirmed that we were at one of the top places to play inland golf in the country. After an engaging outward half, the back nine don’t disappoint in any way whatsoever. In fact, if anything, the natural beauty quotient is cranked up even higher with the highlight for me being the beautiful 12th - think Royal County Down’s 9th where the fairway drops down from a plateau to green level - followed by wonderful back-to back par threes that skirt little Loch an Eerie. It’s a stunning little trio of holes that makes best use of every inch of the landscape on that part of the property. I can’t remember when I last saw so many green keepers working on a course (I was told there were 20 working between the King’s and Queen’s with a similar number on the temporarily closed PGA Centenary), mainly hollow tining greens - about half the putting surfaces had been worked on – so the current major renovations off the course are being matched on the fairways and greens. I played the course as a corporate visitor at the end of November after it had been closed for a week due to flooding. Unsurprisingly the course was fairly soggy, but there wasn’t too much standing water. As a result the course played deceptively long for a such a short track. Our enjoyment was not dampened however, (though our feet may have been) as the layout is delightful. Every hole, bar a couple) have either stunning views across the valley or else are pretty enough in themselves that you feel like your playing on a site of outstanding natural beauty. The greens were in good condition, albeit very soft, and they ran true and consistently throughout. The first six holes unfold along the high side of the course before dipping and weaving for the middle 6 holes in preparation for the final leg home. The topography gradually plays a bigger factor in the challenge. A few blind shots from the tee, and big changes in fairway levels really did make you have to think where you put the ball between tee and green and a well placed drive catching a downslope can easily knock 20-30yards off an approach shot. The scorecards have suggested timings per hole, which is a great idea, and we were politely chivvied along by a marshall on the 10th hole as we had dropped behind (unfortunately 4 ball corporate golf is painstakingly slow). The clubhouse and facilities were among the best I’ve ever had the privilege to use, although we couldn’t avail ourselves of the half way hut for lagging behind our schedule. I’d love to come back and play this course again on a dry summers evening (perhaps a foursomes or 2 ball) as well as try out the Kings Course.